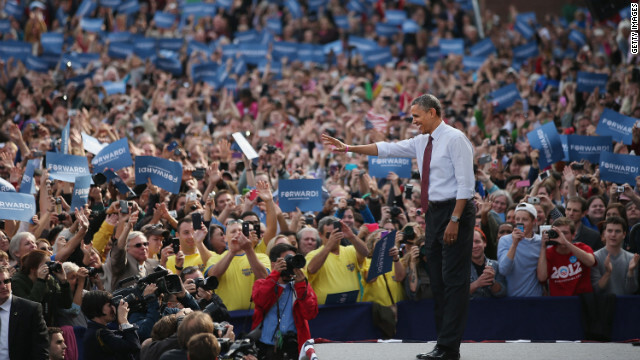 Nashua, New Hampshire (CNN) – In the latest sign of just how tight both presidential campaigns view the race, President Barack Obama rallied voters on Saturday in New Hampshire – a battleground state that caries just four electoral college votes. Obama carried the state by a 10 points four years ago, but his fortunes in the Granite State now are considerably more in doubt. Obama's victory in 2008 was largely due to support from self-identified independents, who make up more than a third of the electorate. I see that CNN is reporting the photo op of Obama visiting the Red Cross, in response to Hurricane Sandy. Why doesn't Obama visit the Red Cross in Benghazi ??? ... oh, that's right, the Red Cross in Benghazi, along with the British Embassy, exhibited leadership, by recalling their personnel, before they could get murdered. Hurricane Sandy is estimated to cost Americans 20 Billion dollars ... Obama has already cost Americans SIX TRILLION DOLLARS ... Hurricane Sandy has taken 40 lives ... Obama's Fast and Furious disaster ... and Benghazi disaster ... have taken the lives of 6 brave Americans ... and, over 200 innocent Mexicans ... and, both Obama disasters were lied about, and covered up ... which are the greater disasters ??? ... Save America ... replace obama with Romney on November 6th !!! Clinton was disbarred by the State of Arkansas. He also paid a $25,000.00 fine there. This was all over the Lewinski incident. He also paid an $850,000.00 settlement over the Paula Jones incident. He was also disbarred from practicing law in front of the Supreme Court. So Bill Clinton, a disbarred lawyer, a President who was impeached for lying under oath, asks the American people to believe him when he says the best thing for the country is 4 more years of 0bama.
? might want to fact check yourself there, Clinton was never impeached. And under the Clinton administration we had a surplus... Seriously dude, fact check! dont forget the death of Vince Foster, at the time he was considered one of the best lawyers in America. He was white house council, charged with defending the clintons...killed himself over all of the obstruction of justice and evidence tampering...horrible. Some of us remember. Rombey has WAY bigger crowds in NH. whose Rombey? I hope he's not running for president under that silly name. Jerry needs glasses and howard you just need an enama . Forward vote all reppublicans out . Your either on welfare or a member of a union. Liberalism = Socialism. bad day for America when the president of our country uses a man of clinton's caliper to tout him in the polls...sick sick. you see these people hope you have a short memory...and the young do and so do many immigrants.. sick sick sick and revealing to those who can think for themselves and really care about their country. god help us if obama gets another term..God save us! President Clinton: when he was in office had a balanced budget and was paying down the national debt at a vigorous rate. Then President Bush came along and started two wars funded with loans from China and then of all dumb moves enacted the largest tax cut in fifty years that doesn't run out until Jan 2013. This provided the wealthy with 12 years of tax breaks to create jobs and it didn't work. Trickle down doesn't work! President Clinton certainly has misstepped in his private life but he is a national leader with experience and wisdom. Really? Where did you get this information...off obama's web site? During Clintons first two years he had control over both houses and spent like mad...his econmy was bolstered by the dot.com boom which crashed in 2000-2001. The takeover of the congress by conservatives kept clinton under control...except for the sexual escapades and his destruction of the military and the intell agencies. He was reelected because Ross Perot pulled 20% of the vote from the GOP...the only reason...his terms were full of graft and corruption and scandle...Bush, if anyone inherited a mess...soon after taking office 9/11 occured and just before the USS Cole crisis...the crisis in the middleast was unfolding...and THAT my ignorant friend was NOT Bushes fault...but he did have to address it, clinton would not! Now you have another lieing Marxist in the presidency and yes...again the middleast and now Africa is on fire...not to mention China and Russia's military build up...and the national debt...and and and...everywhere you look it is a mess...and you still believe it was President Bushes fault. guess he better promise New Hampshire some money or aid or welfare or unions or ??? Buying votes is all he has left. Oh wait there's a crisis happening, better fuel up Air Force 1 & head to Vegas. Obama rocks!!!!!!! Robme needs to be deported to china. Obama 2012. I do not see on TV Romney with large crowds; who are you kidding? Unions are great for the American worker. Ever wonder why CEOs and business will change just to keep a union out. Get real! God help us all if Romney steals the election! Jesus Christ you Republicans are tools. Mitt Romney is the biggest liar ive personally ever witnessed in Politics,the fact that hes running for President and is supposedly "surging" in the polls speaks volumes to the intelligence of the people asscoiated with that party and the American population in general. Anyone with half a brain and a working computer could spend 10 minutes on freakin youtube and find countless videos of Mr.Romney saying exactly what the crowd wants to hear,supporting both sides of multiple issues,then ignoring any followup questions and just pretending he didnt just say that. I pray that the tightness showen in these polls is just bs used by the news networks to give them something to talk about, that the American people arent actually that stupid and can spot a liar when they see one.The world cant afford A president like the one Mitt Romney would be.